A rose garden with a trellis on the estate of Albert C. Neufeld at 204 West Whitney. The house was built by Mr. & Mrs. Neufeld in 1940-1941and was designed by Clarence Jahn of Foeller, Schober, Berners, Safford, & Jahn of Green Bay in the Georgian Revival style. Mr. Neufeld was in the lumber business and was a founding stockholder of Fort Howard Paper Company. The property was occupied by Mr. & Mrs. Neufeld until Mrs. Neufeld's death in 1975. Then their daughter, Mary Ellen, and her husband, Patrick Martin, occupied the property until her death in 2008. The property is currently owned by her children through the Mary Ellen Neufeld Martin Living Trust. The rose garden was on additional property purchased after World War II. It was laid out to serve as a location for garden parities. 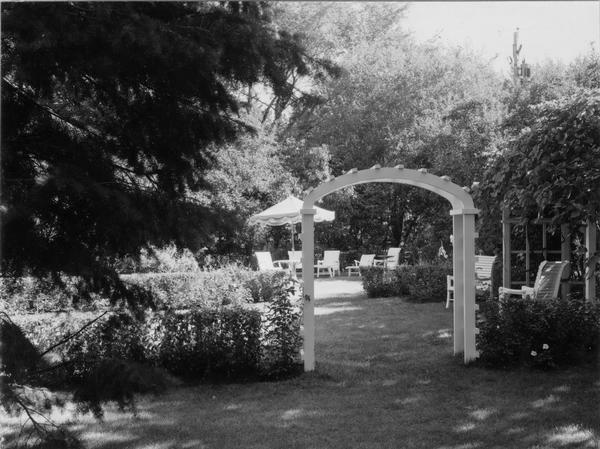 It was the location of the wedding reception for Mr. & Mrs. Neufeld's daughter in 1949 and their granddaughter in 1978. Jens Jensen was a consultant on the landscaping on the original property, making it one of the few Jens Jensen properties in Wisconsin. The house was featured in Architectural Digest in 1977. The interior has a quarter sawn white oak with raised paneling Library, a hanging black walnut spiral staircase, and antique Zuber wallpapered Dining Room. In the interior there is an 80 foot vista through the house from the Living Room fireplace through a bow window in the Dining Room that ended 180 feet later at the arbor in the center of the rose garden. Both Mr. & Mrs. Neufeld and Mrs. Martin employed a full time gardener to care for the property. Mrs. Martin was assisted by Schroeder Flowers of Allouez.